The Ambassador of the State of Israel to Belize, His Excellency Shmulik Arie Bass and his wife Mrs. Meirav Peleg-Bass made an official courtesy call to the Mayor of San Pedro Town Daniel Guerrero and Deputy Mayor Gabriel Nuñez. 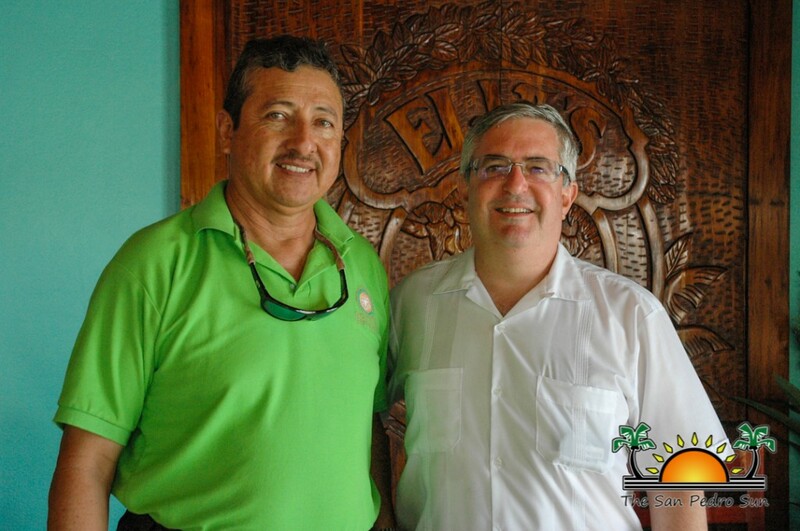 Bass’ visit to Ambergris Caye was part of his end-of-duty tour to Belize as the Ambassador of Israel to El Salvador and Belize. On his first visit to the island over two years ago, Ambassador Bass introduced some businessmen to Ambergris in an effort to explore business opportunities. And as the head to diplomatic mission in both Belize and El Salvador for the past three years, Bass brought several projects to Belize. “We brought for the first time, a musical exchange program with pianists offering free concerts and working with young musician to improve their skills. In addition, we conducted for the first time a photographic exhibition of old, sacred and even modern places from my country. The Israeli Government secured founding for drip irrigation systems through the Ministry of Agriculture so that farmers can study on how to improve production and we also continue to offer technical assistance to Belize whereby we send people to Israel to improve their profession in various areas. So we continue to look at ways that we can help Belize and foster the good relationship we both enjoy,” explained Ambassador Bass. On his farewell visit to the island, Ambassador Bass and his wife were hosted to a short tour of the island, followed by a lunch with Mayor Guerrero and Deputy Mayor Nuñez. Mayor Guerrero took the opportunity to express gratitude to the Ambassador for his support in fostering and strengthening the relationship between the two countries. Guerrero also wishes Bass all the best in his future as a career diplomat. Ambassador Bass thanked the Belize Government and people for the warmth and friendliness extended to the Israeli Government and people. A new Ambassador has not been selected to fill Bass’ position, but that announcement before August.